It’s been a while since I have posted our adventures on the reservation. Yesterday was a day to “write home about.” Our plan was simple, have a dog put to sleep, bury her and not get caught, pick up 12 dogs/puppies that had been spayed and neutered that day. Just a simple routine run. Many of our friend’s know that nothing is simple and routine when Sheri and I get together. WARNING: This is a longer than normal post. Sheri and I had to run a dog to the vet to be put down. She had not recovered from a long illness. She was wasting away and couldn’t stand. It hurt our hearts to see how far downhill she had gone. Sheri carried her into the vet and laid her on the table and the she was given a shot that would allow her to go to sleep and stop any pain she may have been in. This made the 21st dog that had to be put down and I know it hit Sheri hard. After she passed, Sheri wrapped her up in a blanket and brought her to her vehicle. Then we drove to a peaceful spot where Sheri had buried the rest of this Momma dog’s family. Sheri grabbed her shovel and I kept a lookout in case anyone was coming. If they did, I was to honk the horn, that wouldn’t be obvious in any way. She buried the Momma had a moment with the grave and came back to the vehicle. That part of our trip was done. Sheri changed clothes out behind the vehicle, all that was left to do was spray a ton of Lysol in the truck. I only gagged on the fumes a couple of times. It was time to check on the puppy in the back of the SUV. He was going to a new home and was along for the ride. Sheri had put heavy blankets around his carrier so nothing could get into it. When we went to check on the puppy, he was going to a new home, he had pooed in his carrier. Yum! That was a special little surprise. We cleaned that up and headed to our next stop to drop the little guy off to his new folks. So we loaded up and headed off to our next stop, which was a gas station. Panda’s new folks drove three hours from Wyoming to pick him up. It was easier to meet them off the freeway, so they could just hop back on the freeway to head back home. When we do these runs to Hardin and the reservation, I always like to stop for a corn dog. It’s Sheri’s fault, she is the one who got me started on that little addiction. I waddled up to the counter and told the gal I wanted 4 plain corn dogs. Not the chili ones, not the jalapeno ones, but plain corn dogs. The little gal rang me up, ran to the case and told me they only had 2 regular corn dogs. Only 2?? I inquired as to how long it would take to make 2 more. I was told 12 minutes, so I had her make us two more. Sheri and I at our corn dogs while we waited for the other 2. We discovered that when the corn dogs are fresh, they are much more crunchy and tasty than the “God only knows how long they have been around ones.” Who knew? We ran to an abandoned trailer to try to pick up the rest of a litter of puppies Sheri had found last week. We have been there before and the kids are not nice to the Momma dog at all. They hit her with sticks and yell at her. She had picked up some of the puppies and wanted to see if the others would come out. We parked and Sheri dumped out a big bag of food for all the adult dogs milling around. It’s so sad to see how they dive for that food, they don’t know when they might eat again. She put some food near where the puppies were hiding to see if they could come out. We did catch one of them and as I brought it to the truck, my foot sank in a big puddle next to the truck.Sheri ended up in another puddle which got her foot all wet. Are we having fun yet? Our next stop was to drop off some food to a sweet old Indian woman who feeds the dogs in her area, we drop off food for her so she can feed the stray dogs. She told Sheri about some dogs that needed homes. They came from a home she had picked up other dogs from. So we took off in a flash to get them. It was dark and Sheri thought she knew where she was going. When she was going to go up a one way, we realized we had to regroup and change directions to find the place. We got there and a dog was chained in the front yard barking to beat the band. Sheri went up to the door and told them who she was and who sent her. They brought out an ugly, mangy bat looking dog, we think it’s a chiwennie. They also gave us a solid black pup, about 4 months old. He is a lab, pit, border collie mix. Where were we going to put these little darlings? Why in the front seat with me of course! The crates in the back were for the puppies we had to pick up at the vet. The back seat was for the adult dogs who were fixed. Why not have these guys in the front with me? It was that or strap them to the roof. They were both very, very busy! Wanting to shift gears for Sheri, climbing all over. While bat dog was moving around I screamed because I realized he was not fixed and I was touching his balls. Yea!! They both smelled to high heaven and have scabs all over. They would move around, I was grab them, Sheri would drive, they would try to help to drive……..you get the idea. The little puppy we picked up under the trailer had to be dropped off at our foster home in Hardin. Sheri wormed him, gave him his first round of shots and his kennel cough vaccine. The fosters already had his brothers, so it was a family reunion of sorts. Time to pick up all our puppies who had been fixed and bring them back to Billings. All the while trying to keep our two new travelers on my side of the SUV. It was quite entertaining to watch. Not as entertaining to participate in. At the vets place we got the bill for the fixing and for a puppy to have her leg amputated. We swallowed hard and started loading up dogs. That went quicker and better than I anticipated. With everyone loaded up, Sheri holding the new amputee in her lap we were off. The two new pick ups were still busy and one even helped Sheri by putting her truck in 4 wheel drive, which meant we had to stop on the middle of a road for a minute to fix that. The black puppy, now known as Biff, decided he would snap at Eileen on Sheri’s lap. The bat dog finally fell asleep and Biff did for a short while as well. Only 5 more stops to go, we were on a roll! One set of fixed puppies are being fostered by Tere, she lives about an hour from Billings. We met her off the interstate so she could take her foster pups back home until Saturday. (We were having so many meetings off the interstate it almost felt illegal) While we were waiting for Tere, Sheri took Elieen outside for a bit and I stayed inside with the hell hounds. Bat dog decided to walk over the top of Sheri’s keys in between the seats and suddenly the alarm on her SUV was going off! It freaked me out and I paused for a minute. Sheri came flying up to me, yelling to get the key. I already had the key in the ignition and was hitting buttons. Sheri is yelling, I’m trying to keep the dogs off my lap and finally I find the right button. Silence. I hop out of the SUV and Sheri yells, “Don’t shut the door! All my keys are in there!” I had no intention of shutting it, just enough to keep the dogs in. Sheri and Tere start loading up pups. Someone stops to ask us about the dogs and we are ready to go to our next stop. We were still bickering back and forth as we pulled away. Tere was just laughing. Billings Animal Rescue Kare was our next stop. We work hand in hand with them. Sandy, the director, was more than willing to take in the ugly bat dog. Errrr, adorable little darling. When we arrived we had her look at Biff as well, we wanted to make sure he didn’t have the bad kind of mange. She gave us both a big hug and had vases of flowers for both of us. She told us how sorry she was about our having to put down Momma dog. The flowers almost made me cry, but I was too tired and we still had a few more stops to make. 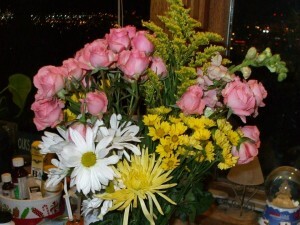 It was the highlight of our night, the kindness of the flowers in sympathy for putting down Momma dog. It was time to drop off Elieen, our amputee, and we started sniffing the air. Biff had pooped in his crate and it stunk to high heaven. We were driving around with the windows down just laughing about how awful it smelled. That was a great way to cap off the night. We dropped the pup off at a ,new to us foster. She is a sweet gal and didn’t say a word about how bad the truck smelled. While we were gathering stuff for the pup, Sheri realized our flowers had fallen over and gotten things wet. Her bag of shots had fallen open and we had to find those. Time to head to our next destination. We arrived at Rnita and Doug’s with their set of puppies. Our windows were open so we could breathe a little easier. Biff was in the back screaming. I had to pee. We had to bring the pups into their foster home. We brought puppies in, I peed, the paperwork was wet from the flowers. All in all a successful drop off. Time to had the Holiday Inn to drop off a poster for a fun play and benefit, The Prince Theater is having a play tonight and for the next several weekends. Some of the ticket sales will go towards Billings Animal Rescue Kare and they will have donation jars out for the other rescues in the area. Sheri’s ex-husband made us a great sign. We had to drive around until we found the right door. Dropped it off and time to head to my house. All we could do was laugh about the smell, with me grumbling about our new foster pup. We arrived at home and Mr. Bernie let Patch come out to greet us and meet the new stinky puppy. Sheri gave him his shots and he found a rawhide and settled in for a while. Biff stinks and has mange but that will all be fixed in a short while. I was ready for a long hot shower and bed. Poor Sheri still had 3 more stops to go that night. Just a typical night for Rez Dog Rescue. Sandy, funny you should refer to us as Thema and Louise. I never told anyone this but that is what Vicki, my roomate called the momma dogs, and I kind of thought of them as that. I would love to come to one of the meeting, but, I can not remember when I wasn’t running on a Thursday. You know you could make short movies about your adventures in dog rescuing & everybody would flock to see them? They would be rolling in the aisles! I’m sorry you had to loose poor Momma dog but I laughed my head off at the rest of the adventure. I think if we didn’t laugh at some of the stuff we would walk around crying. *lol* We try to find the funny side of our adventures. Sounds like a great night. hope you sleep well. you and Sheri are so caring. I did sleep pretty good, once I feel aslseep. It would only work if it was smell-o-vision. Your timing was so perfect last night. The first Thursday of every month we have a Pet Loss Support Group meeting. I really wished Sheri and Bernie could have stayed. Maybe if there’s no Hardin runs next month they can join us. We had just started talking about the life and death cycle when Thelma and Louise brought in a handsome, skin and bone, mange eaten and sweet Chiweenie. Why they would call this good lookin boy a bat dog is beyond understanding. I think Thelma and Louise have a hard time with any lap dog that is under 50 pounds. The smell will leave in a couple of days of oral Ivermectin and a bath. Good groceries also helps a bit. I’m so very impressed with how BatDog looks today! You guys did amazing work and he actually looks like a dog. Oh my goodness—I hope Sheri’s car gets aired out….you guys must have slept well last night! The smells that have been in Sheri’s car are un-describable!